Among the leading causes of people grinding their teeth is stress and anxiety. Your dentist may have asked you if you grind your teeth at night, but he’s not just worried about the effects it has on your teeth, it can also have impacts in on your jaw, cause headaches, ear pain, and even lead to a lack of sleep. Here’s what you need to know about teeth grinding and your health. Teeth grinding, or bruxism, as it is also known as, occurs when you clasp your teeth too hard or rub your teeth over one another. In many people teeth grinding can happen while asleep, and they may never know about it. Teeth grinding can wear teeth down and put undue force on the jaw. Though there are many reasons for bruxism, stress is by far the largest factor in it occurrence. Taking the time to relax muscles in your face and jaw at various intervals in the day can help to relax you. Of course getting rid of stress is never an easy task, but by practicing things like mediation and yoga, you can train your body to be less stressed by daily endeavors. Getting regular exercise, getting counseling, and eating a healthy diet can also help alleviate the triggers that cause stress and anxiety. Some people have sleep disorders which are also known to result in teeth grinding. If you suffer from teeth grinding, then your dentist could recommend a mouth guard to protect your teeth while you slumber. In extreme cases, muscle relaxants can be used before bed to relax the mouth. 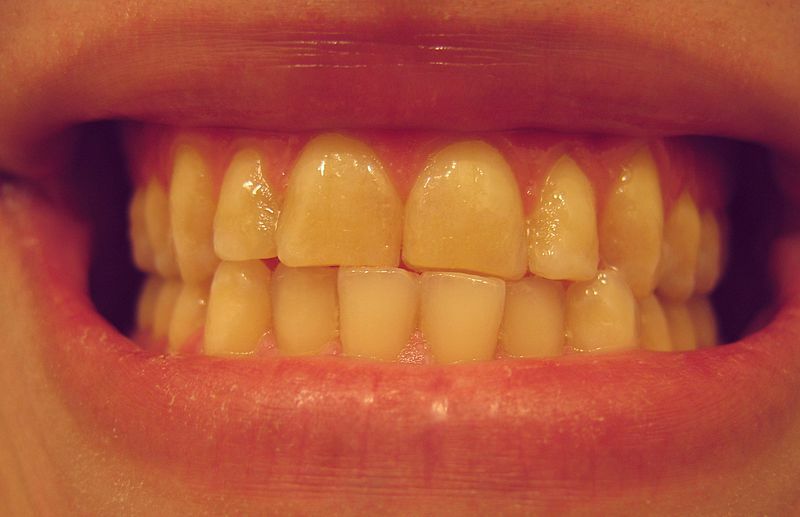 Teeth grinding also occurs more frequently in people with misaligned bites or missing teeth. Though most teeth grinding is not harmful, those with chronic bruxism can wear their teeth down to abnormal levels. Chronic conditions can also affect your head and face in other ways as well, such as causing TMJ, jaw pain, and even alter your facial structure. Over two-thirds of teeth grinding happens while people sleep and most is thought to be due to stress or anxiety. Some antidepressants can also cause teeth grinding as a side effect. Various forms of sleep apnea, such as obstructive sleep apnea, have been shown to lead to nighttime grinding. Often people do not know that they are grinding their teeth until someone they sleep with ring s it to their attention. If you think you might grinding your teeth, your dentists can look at your mouth and jaw for the signs of this and go through various choices of treatment. Some easy options can include modifying your diet to cut down on drinks and food containing caffeine, and also limiting alcohol. Adults are not the only ones to grind teeth either, as between 15% to 33% of kids also are thought to do so. Children seem to grind their teeth when they are getting baby teeth and also when their permanent teeth are coming in. This bruxism then stops as the children grow other. If you have question about teeth grinding, suspect you might be grinding your teeth at night, then let Portland dentist Dr. Jarvis at Southwest Portland Dental know the next time you visit.